Start Dates: October 2017 (start dates negotiable with reason). 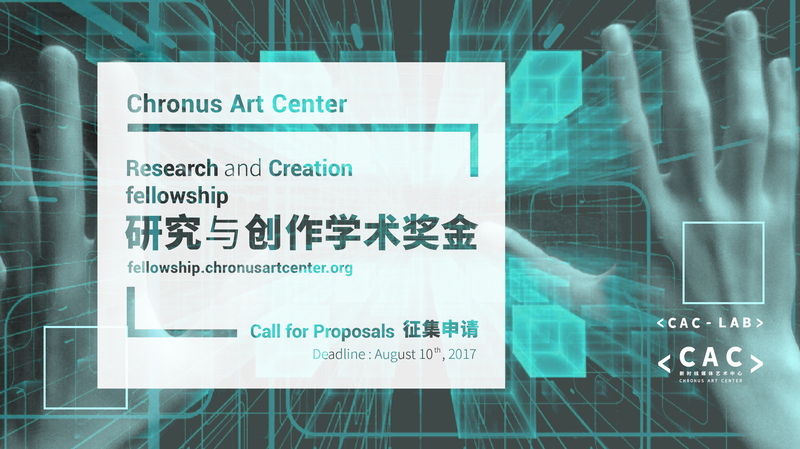 This year Chronus Art Center (CAC) opens its Lab for the second 3-month research and creation fellowship. This program is designed to host one international artist and researcher of extraordinary talents in the area of new media art in order to conduct research and creation at Chronus Art Center (CAC), Shanghai. The 2016 Research and Creation Fellowship aims to foster global exchange while advancing the discourse and practice of new media art, and contribute to CAC's research and educational mission as well as the institution's future collection. As augmented reality (AR) technologies grow in popularity, other fields of the MIXED REALITY space are lesser-known. AUGMENTED VIRTUALITY differs from AR in subtle forms, where AR introduces digital elements to a physical space augmented virtuality absorbs “real” elements into its virtual landscape. For this occasion, the LAB is seeking for project proposals which make use of our OPTITRACK real-time motion capture system (for more info please see: https://www.optitrack.com/). The submitted proposal should address the topic of AUGMENTED VIRTUALITY while utilizing this high end, research level MOCAP technology. Artist working in the fields of immersive experiences, physical computing interfaces, sensory immersion, mixed reality systems, robotics, interactive spaces, among other related fields, are welcome to apply. - x8 Prime 13 high speed POE infrared cameras installed on a 4.5m x 5.0m empty and white space with a side control room. - Oculus ready Asus PC. - Motive, professional optical motion capture software. - Set of infrared markers and gloves. - Easy to use calibrating tools. * All project proposals should make use of the OPTITRACK system. The selected Fellow will be expected to work at CAC's laboratory with the research and creation team on a range of activities including: active contribution to the larger CAC community, collaborative partnership with other fellows, leading research initiatives, educational programs and public engagement, and developing current or future research areas for the organization. Projects, including prototypes, documentation, and work-in-progress, will be presented to the public at Chronus Art Center. This fellowship is open to international artists and researchers of all nationalities. Applicants should be able to use English as working language. Applicants must not be currently enrolled in degree-granting academic programs, with the exception of PHD candidates who are aiming to develop technical work within the scope of the fellowship. Applicants are expected to show demonstrable success in previous development of related projects at this scale. Individuals and collectives are eligible to apply. In either case, please detail in your application how technical and creative responsibilities will be met. Only proposals within the conceptual framework offered by AUGMENTED VIRTUALITY and which make strict use of the optical motion tracking system (described on the overview section of this document) will be considered for eligibility. This Fellowship is a chance for international artists and researchers to engage and learn from the art, technological and entrepreneurial communities of Shanghai. The selected Fellow will be offered a total amount of USD$10,000 for a 3 month deep-immersion period; including artist fees, living expenses and materials. In addition our lab facilities and tools are available for the fellow's needs; these include but are not limited to: Laser-cutter, bandsaw, sander-belt, press drills, all sorts of hand tools, a variety of electronic components, arduinos, raspberryPis, an oculus rift DK2 headset, Surface Mount Infrared soldering, soldering irons and other prototyping tools. For international Fellows, CAC is happy to provide necessary paperwork and advice to help expedite the process of securing his/her visa, travel and accommodation in Shanghai whereas all the expenses will be covered within the amount of the fellowship. During the 3-month program, CAC will work closely with the selected Fellow to see his/her project realized and offer program support in developing work for performances, events, seminars, exhibitions, or other public and educational programming during the term of the Fellowship. CAC will also facilitate joint presentations alongside community partners, host conversations with the artists and display works in progress; revealing the creative process as it happens. Please fill out the online application form and submit it with the necessary attachments via http://fellowship.chronusartcenter.org. No email submissions will be taken into account. Applications will be reviewed and the final decision, including interviews, will be made by CAC's International Advisory Board comprised of leading scholars, artists and museum professionals.